"Knit your heart with an unslipping knot" Shakespeare. One of the most important things i've learned is that Love is often spelled TIME, and what better way to say I Love You than with a knitted gift. The time you spend choosing the yarn, the pattern, completing the project - all reflect a heart set on conveying a simple, basic truth - the treasure of the friendship and love that has grown between you. Cast on a multiple of 3 stitches + 1 extra stitch. Row 1: *K2, P1*, repeat across, ending with a K1. Row 2: P1, *K2, P1*, repeat across. 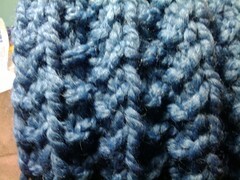 Repeat Rows 1 & 2 to desired length. Love .... can be found when you least expect it .... is it in the giving or the receiving? .... i vote you try giving it away ... and before long you'll come to see that you can't outgive the Lord .... your heart will be full with the joy that only comes in sharing ..
.... now faith, hope, love abide, these three; but the greatest of these is love. I LOVE the pattern drawer. and this post made me smile :) you should consider using a pencil for writing as much as you use needles for knitting. i'm convinced the talents are equal.